(Interface: SATA 3.0. 1) standard SATA-13Pin (6 7) optical drive interface, supports SATA-I / SATA-II / SATA-III transmission standards. (New PCM board support). Notebook hard disk drive bay. Applicable hard disk: SATAI II III on behalf of the full range of hard disk. 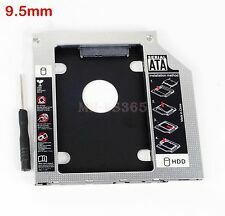 9.5mm For Apple Macbook Pro SATA 2nd HDD SSD Hard Drive Disk Caddy Optical Bay. The Universal SATA to SATA Caddy is compatible with all the for APPLE MacBook which has a 9.5mm thickness SuperDrive with SATA interface. OWC Data Doubler Optical Bay to HDD/SSD Apple Macbook Pro . Condition is Used. Shipped with USPS Priority Mail. 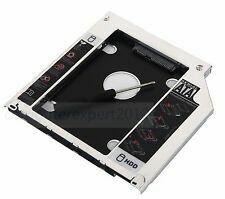 2nd Hard Drive HDD SSD Optical Bay SATA 9.5mm Height Caddy For Apple Macbook Pro Unibody. This caddy only fits unibody models (Late 2008 / Early 2009 / Mid 2009 / Late 2009 / Early 2010 / Mid 2010 / Early 2011), NOT suitable for other non-unibody models. This 2nd SATA HDD Caddy is special designed for Unibody MacBook, MacBook Pro 13" 15" 17", it gives you maximum storage flexibility enabling you to add a second hard disk drive. With the second HDD in your Unibody MacBook (Pro), you have the fastest way to back-up key applications and critical data. 2nd HDD SSD SATA 9.5mm Hard Drive Unibody Caddy Adapter Swap Apple MacBook Pro Unibody SuperDrives. Unibody MacBook: MB466LL/A, MB467LL/A, MB881LL/A, MC240LL/A, MC207LL/A, MC516LL/A. Unibody MacBook Pro: MB470LL/A, MB471LL/A, MB604LL/A, MC026LL/A, MB990LL/A, MB991LL/A, MC118LL/A, MB985LL/A, MB986LL/A, MC226LL/A, MC371LL/A, MC372LL/A, MC373LL/A, MC374LL/A, MC375LL/A, MC024LL/A. Cable SATA3.0. Unibody MacBook: MB466LL/A, MB467LL/A, MB881LL/A, MC240LL/A, MC207LL/A, MC516LL/A. Unibody MacBook Pro: MB470LL/A, MB471LL/A, MB604LL/A, MC026LL/A, MB990LL/A, MB991LL/A, MC118LL/A, MB985LL/A, MB986LL/A, MC226LL/A, MC371LL/A, MC372LL/A, MC373LL/A, MC374LL/A, MC375LL/A, MC024LL/A. Trending at $7.97eBay determines this price through a machine learned model of the product's sale prices within the last 90 days. 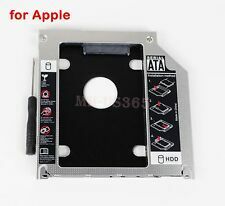 Categories for Universal Apple Macbook Pro Optical bay 2nd HDD Hard Drive Caddy SATA 9.5mm. Thickness: 9.5mm. Size: 127mm*127mm*9.5mm. Applicable hard disk thickness: 7mm, 9.5mm, 12.7mm. Interface: SATA. Standard SATA-13Pin (6 7) optical drive interface, supports SATA-I / SATA-II / SATA-III transmission standards. (New PCM board support). 1 x 9.5mm Hard Drive Bay. With hard disk channel switch. Apple Macbook Pro SATA to SATA laptop drive hard drive bay. - Applicable models: Macbook Pro laptop with optical drive interface is SATA interface. 1x Drive Bay Caddy. 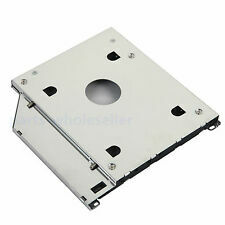 Aluminum 9.5mm 2nd HDD Hard Drive Caddy SATA Optical Bay For Apple Unibody MacBook. With the second HDD in your Laptop, y ou can speed to backup important applications and critical data (Simply remove your SuperDrive and put the Caddy (with the added hard drive) in its place. ). Add this caddy to your laptop to give you another hard drive. Simply remove your CD-ROM drive and put the Caddy (with the added hard drive) in it's place. This is a good working adapter. This device accept 2.5"/9.5mm SATA SSD HDD.